I wasn’t a full-on participant in VeganMoFo, but I sure have enjoyed this undertaking. I would like to especially commend 3 fellow bloggers I read regularly for their faithful posting this month. Jenna of B36 Kitchen posted nearly every day while traveling and taking care of her newborn daughter. 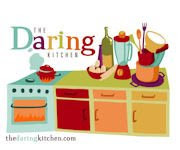 Celine, my baking queen, of Have Cake, Will Travel, perhaps didn’t post her mouthwatering recipes every day, but made up for it with 2 or 3 posts on some days. And Bazu of Where’s the Revolution? provided us with her usual insightful and informative writings and beautiful food pictures every MoFo day, including once while inebriated! Awesome job, ladies. Thank you! My end of November offering is this gluten free loaf of Cranberry Banana Quinoa Bread. I slightly adapted this recipe, which will also point you to wheat and oat version, by replacing the 2 eggs with 1 flax egg, adding cinnamon, and using fresh instead of dried cranberries. The bread tastes wonderful, is very moist, and keeps well in the fridge. It would make nice mini loaves for Christmas gifts! Another successful V-con recipe. It’s not quite as pretty since I used pinto beans instead of black beans as the recipe called for, but I had just made a pot of homemade pintos and actually didn’t even have a can of black beans. I also didn’t have all the ingredients for the yummy pineapple salsa to go with it, so I sliced some avocado and used my favorite local tomato salsa for the topping. But I did have the basics – spaghetti squash, corn, and plenty of cilantro – spicy and delish! I jinxed myself by bragging about running around in shorts and sandals all month. That totally changed Thanksgiving, so I’ve been keeping busy in the house and keeping my oven on. I happened on to these “croutons” awhile back when making pizza. I had diced the tofu too small and in a really hot oven they nearly disintegrated. When done right, the nice thing about the croutons is they stay crispy on top of the veggies, but get soft again when mixed in with the hot broth. I made our side dish – a ring of wild and white rice with roasted Brussels sprouts. We can’t get enough Brussels sprouts these days! We had some crusty store bought French bread to gather up all the goodness. For dessert we had the best muffins I’ve made in a long, long time. I suppose it’s because they are made entirely with wheat flour (I shouldn’t eat) that made them rise so high and taste so light. They are Pumpkin, Millet, and Chocolate Chip Muffins that I adapted from this recipe, eliminating the dairy products and processed sugar, and adding chocolate chips. Toasted millet replaces nuts, and after several bites trying to figure out what the millet reminded us of, it hit – candy sprinkles! I’ll include my recipe because I hope if you have leftover pumpkin from Thanksgiving, a chocolate craving, and are in the mood for a unique and fun crunch in your muffins, you’ll give these a try. I hope you all enjoyed the long weekend as much as I did. I relaxed as much as possible because I know from now until the end of the year will be crazy busy. I’ve been making this apple butter for years. It cooks all day in the crockpot and except for peeling and chopping the apples, couldn’t be easier to make. So if you’re stuck at home by choice or because it’s just too darn cold and wet to go out, give this recipe a try. Your home will smell wonderful all day long. Peel, core, and chop the apples. You can puree them in the food processor before cooking, or puree after cooking with an immersion blender (which is what I did). If you prefer a chunky apple butter, just finely chop all the apples. Put the apples into your crock. I have a large one and it was almost completely full. Cover and cook on high 1 hour. Reduce the heat to low and cook for 10 hours, stirring every couple of hours, until the apples are dark brown and thickened. Uncover and cook on low one more hour. Stir, blend if necessary, then put into sterilized jars and keep in the refrigerator. You should have 5+ half-pints of apple butter. What did I do with my “plus” amount of apple butter? I made Kris’s Damn Tasty! Apple Butter Cookies. The cookies are big and soft and of course, delicious! It was a wonderful, record-setting 89 degrees on Wednesday; now it’s cloudy and 45. At least I had an excuse to make soup. After two great soup recipes from V-con, I went back to Nava Atlas’ Vegetarian Soups for All Seasons. The Curried Millet Spinach Soup is hearty and perfectly seasoned just as written. I’m not a big fan of curry powder, but the mere 2 teaspoons for 8 servings is just right. It makes a big pot. I used sweet potatoes instead of white, since that what I had on hand. I needed to add 1-1/2 cups of water to the pot when I reheated it, and added just a touch more salt and pepper. A small bowl is very filling. I'm going to have to bake all day to stay warm. Sunday night was Vegan Thanksgiving for Chase and me. I made a little bit of a lot of different foods. Our meals for two smallish people may seem huge, but please know that none of it is ever wasted. Chase loves to take home leftovers and my freezer remains full of desserts. My goal for the meal was the usual Thanksgiving flavors with a modern flair. I believe the only thing I left off the traditional menu is stuffing, which neither of us cares for. I baked a day in advance and the rest of the dishes were easy to prepare the day of. The fresh produce made for a fantastic meal - Saturday’s Farmers Market was a gold mine. I found green beans, sweet potatoes, apples, peppers, sage, garlic, onions, broccoli, and kale. The delicious Snobby Joes from V-con made a wonderful retro meal. I remember corn always being served with my prevegan sloppy joes. I added broccoli, red peppers, and onions to my corn. I served the Joes on toasted spelt English muffins, and also served an iceberg salad with homemade “ranch” dressing. I couldn’t wait to try another one of Isa and Terry’s soups, and the broccoli soup was next on my list. Mine may be a little too brown due to not paying attention to my onions while they sautéed, but it certainly didn’t affect the flavor. The recipe calls for mixing in fresh dill and mint, but also encourages playing around with the seasonings. Mint didn’t appeal to me at all so I left it out. I didn’t have fresh dill, so I used fresh chives. 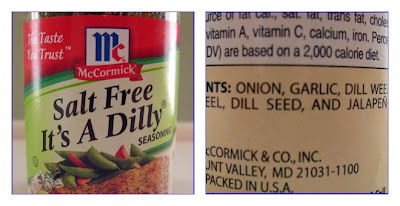 And instead of dried dill, I used this wonderful new seasoning I found while looking for a salt-free blend – McCormick’s It’s a Dilly. Onion, garlic, dill weed, lemon peel, dill seed, and jalapeno - perfect for this soup. I added in a heaping tablespoon of the McCormick’s and wound up with another soup recipe I absolutely love. I’m in such a good mood this evening I’m going to give you a cookie recipe! A recipe for big fat cookies with no redeeming nutritional quality. They are full of calories, fat, and white flour, and oh so good. I veganized the classic recipe. Mix together the flour, baking powder, and salt in a small bowl. In an electric mixer, beat the margarine until smooth. Slowly beat in brown sugar, and mix on medium speed until light and fluffy. Add in egg replacer and vanilla. Stir in peanuts. Use your cookie scoop to drop onto cookie sheets lined with parchment paper; flatten slightly. Bake for 12 minutes. Leave cookies on baking sheet for 5 minutes, then remove to a rack to cool completely. Dust with powdered sugar if desired. Sunday dinner was a quick and easy Indian spiced meal. I made some old favorites and found a new favorite. From the oven: This is my new favorite. After steaming the sprouts for about 10 minutes, I tossed them with chunks of zucchini and onions. I drizzled on a little olive oil and about a tablespoon of cumin seeds, and a little salt and pepper. Then they all went onto a baking sheet and roasted at 425 degrees for about 20 minutes. Veggies + Cumin Seeds roasting together = Yummmm! My stovetop dish was a quick sauté and simmer of 1 head of cauliflower, 1 can of fire roasted tomatoes, and 1 bunch of fresh spinach. I tossed in all sorts of Indian spices – cumin, coriander, ginger, garlic, fennel seed, tumeric, and a little cayenne. It kept warm while the rest of the dishes came together. I guess it set for just long enough because it tasted fantastic. We had been missing our Indian food! The cauliflower looked a little saucy, so I decided to make rice too, just some basmati rice with green onions and cilantro. From the grill: Indian Spiced Tofu, and for me a Portobello. I marinated the tofu and my Portobello in a mixture of vegetable broth, tamari, rice wine vinegar, garlic, agave nectar, cumin, coriander, and red pepper. They just needed a few minutes on the grill. Chase was so hungry we didn’t get a picture. Or maybe he “forgot on purpose” because he came over late and had to grill in the dark. He wasn’t especially thrilled with the way they looked. Nonetheless, it tasted great and we ate it up. I’m always amazed that Chase can eat a half pound of tofu along with huge amounts of the side dishes. Anyway, here’s my plate. Even though I have a freezer full of leftover desserts, I couldn’t help but make a fresh one. If you think I put peanuts in everything, I guess it’s true because whenever I ask Chase what kind of treat he wants, he says “something with peanuts.” The last couple of treats have been quite decadent, so I turned to Everyday Vegan for something low sugar and reasonably healthy. I used the recipe for Oatmeal Raisin Cookies, added ¼ cup maple syrup and ¼ cup chopped peanuts, then pressed the dough firmly into a 7 x 11 pan. I baked them for 20 minutes, then let them firm up in the refrigerator. I ended up with a chewy, delicious bar. In fact, it was so chewy I thought I had added in shredded coconut. We really loved these. Too bad we only had room for a tiny piece. This is a quick salad to put together and a delicious way to get your protein. Mix in your favorite vinaigrette and fresh herbs. I’m feeling very left out of VeganMoFo! I’m a little late, but I’m going to try to jump in now and post as much as I can for the rest of the month. To heck with sleep, chores, and errands. Vegan food deserves the top spot now! My cake is gluten free, but you can make it with 1-2/3 cups AP or WW pastry flour (or a combination) and omit the xantham gum. I get coconut custard powder from the Asian section of my grocery store or the Asian market. Vegan coconut instant pudding mix would work too. Lightly oil a 9 x 5 loaf pan. Mix dry ingredients together in a large bowl. Mix wet ingredients in a small bowl until thoroughly blended. Mix the wet ingredients into the dry ingredients and stir until combined. Pour into loaf pan. Bake for 45 minutes or until toothpick inserted comes out clean. Cool in the pan for 10 minutes, then turn onto a rack to cool completely. This is a nice moist cake with all the right hints of fall and holidays. It’s been a long time between posts, but Chase didn’t get to taste all this food I’ve been cooking until tonight. I’ve been working and reworking this long post for 2 days now, so here goes. Saturday I was so tired from the work week I could barely get myself to the grocery store. I finally did my shopping, then stayed home most of the day to watch football and when my energy returned I broke out the new cookbooks. This has a great smoky flavor and Chase really enjoyed it. It paired very nicely with the stirfry I made. I don’t even like eggplant, but this is about the best soup I’ve ever had. Chase said “wow” after every bite. It’s so rich and incredibly flavorful. I had to alter the ingredients just slightly. Since I didn’t have any shallots on hand, I used yellow onions. Then when the recipe later asked me to add onions, I subbed grated carrots. No matter. You really must make this soup! This is a good recipe, but it is definitely a side dish, or rather an “underneath” dish, like good for holding up veggies. The recipe instructions are a little out of whack. You are instructed to add cloves, but cloves are not listed as an ingredient, and also to add the allspice twice. (I was told this was an editorial issue and cloves are NOT an ingredient.) It is a nice change from plain old rice or plain old lentils and I will make it again. Chase and I both agreed the caramelized onions are a nice touch. On a side note, Sunday Chase and I went to the Lone Star Vegetarian (actually vegan) Chili Festival. It was held at the Austin Zoo. This was the 19th annual state cookoff and most of the offerings were very good. Chase and I had never been to our zoo, which is actually an open air rescue facility. We’ve never enjoyed visiting caged animals, but we did walk along the paths to see lions, leopards, giant turtles, monkeys, etc. It was heartbreaking to read about many of the animals being rescued from research labs. I did take a picture of this colorful, proud rooster, roaming free and not realizing how silly he actually looks when he struts. One of my favorite finds at the festival was this coloring book – it’s so ME! And my favorite page from the book. Another find at the Chili Fest was Vegan Noodle and her new hubby! I recognized her immediately from the wedding pictures she posted. Chase and I went and introduced ourselves and we chatted amidst the humidity and swarming bees. We enjoyed meeting you both, Noodle! After nibbling on brown mushy (but tasty!) chili in the afternoon, I was ready for some crunchy, colorful, fresh veggies for dinner. I made Coconut Ginger Vegetables from ExtraVeganZa. This is made with purple cabbage, broccoli, red peppers, kale, onions, and carrots in a coconut milk, ginger, and cumin sauce. I left out the cashews and served it over soba noodles instead of udon. Very nicely flavored, and again, it paired well with Dreena’s tofu. I left the cashews out of my stirfry, because for dessert I made…. Apple Peanut Caramel Bars from Veganomincon. November 1st was my second veganniversary and I wanted a special treat for the occasion. Graham cracker crust, a layer of apples, and peanut butter caramel sauce topping. Not the prettiest of desserts, but one of the tastiest for any peanut butter lover. Peel the apples. It is difficult to cut through the baked apple peels when serving. Work quickly with the caramel sauce. It cools fast and makes getting a smooth “ribbon” of topping nearly impossible. You may even want to reheat it once or twice to ease the task. If you are truly a peanut lover, you will use extra chunky peanut butter in the sauce and add some chopped peanuts to the topping. Lastly, have ice creme on hand. We warmed our servings slightly and wished for a spoonful of vanilla Good Karma alongside it. I had to put half a pan of leftovers in the freezer because Chase wouldn’t take all of it home with him – for fear of eating it all later tonight. I hope it holds up! Finally, and especially for Veggie Girl, my own recipe for Gluten Free Carob Cookies. These are cakey little cookies made with brown rice flour, quinoa flakes, and roasted carob powder. This was Chase’s second favorite food of the night, the soup of course taking first place. Pour the wet ingredients into the dry and mix thoroughly. Use your cookie scoop to drop batter onto the baking sheets. Do not flatten. Bake for 15 minutes or until just set and slightly crisp on the edges. Let cool on the pan for 1-2 minutes, then remove to a cooling rack to cool completely. Store in an airtight container. Makes 2 dozen cookies. Save some for the next day or two because they keep getting better. Sorry for the long post. Thanks so much if you read it all the way through!